1. Preheat oven to 450°. Line rimmed baking pan with parchment paper or nonstick aluminum foil. Slice a thin layer from narrow end of 1 potato. Stand potato, flat side down, on cutting board. Cut potato into 1/4-inch-thick slices. Stacking 2 slices at a time, cut slices into 1/4-inch-thick pieces. Repeat with remaining potatoes. 2. In large bowl, toss potatoes, oil and 1/2 teaspoon salt. Place potatoes in single layer on prepared pan. Bake 30 to 35 minutes or until golden brown, tossing twice during baking. 3. Meanwhile, in small bowl, stir garlic, mayonnaise and remaining 1/4 teaspoon salt. 4. 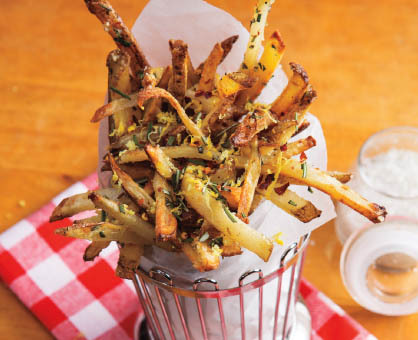 In large bowl, toss fries with cheese, rosemary, lemon zest and crushed red pepper until well coated. Serve immediately.